Software As Capital looks at software development through the eyes of a capital theorist, an economist fascinated by the constant evolution of new and better tools and processes. It asks, what is really happening in software development at the concept level? Why has programming practice evolved as it has? Why are certain tools and methodologies superior to others? What will it take to bring dramatic improvement to the industry? Answers lie in capital theory and the evolution of capital goods. The concept that designing capital goods is a social learning process leads to interesting conclusions about software process models and methodologies. The book examines the main failing of the software industry when compared to other industries: the absence of an extensive division of labor for software components. It sets out the reasons for the problem, an outline for the solution, and the benefits that will result from its solution. 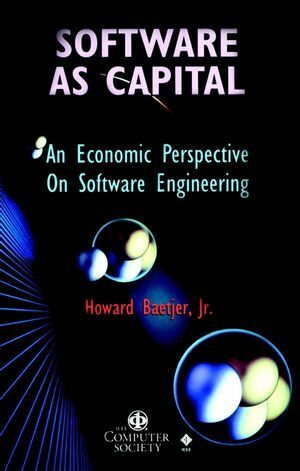 Howard Baetjer Jr. is the author of Software as Capital: An Economic Perspective on Software Engineering, published by Wiley. CHAPTER 1: Knowledge Capital and Economic Growth. BETTER TOOLS INCREASE THE WEALTH OF NATIONS. CORE CONCEPT: THE EVOLVING CAPITAL STRUCTURE. CAPITAL GOODS AND DIVISION OF KNOWLEDGE ACROSS TIME AND SPACE. DESIGNING CAPITAL GOODS AS A SOCIAL LEARNING PROCESS. CHAPTER 2: A Short History of Software Development. OVERVIEW: FROM RESOURCE CONSTRAINT TO COMPLEXITY CONSTRAINT. THE KEY CHALLENGE: COORDINATING DISTRIBUTED LEARNING. THE EVOLUTION OF PROGRAMMERS CAPITAL GOODS. CHAPTER 3: Designing New Software Capital. DISCOVERING WHAT THE SOFTWARE MUST "KNOW": WHY PROTOTYPING. DESIGNING AS UNDERSTANDING: THE ROLE OF TOOLS FOR THOUGHT. INTERMEDIATE GOODS FOR DESIGNERS: REUSABLE COMPONENTS AND PATTERNS. CHAPTER 4: Designing Evolvable Software. EVOLVABILITY AS A DESIGN GOAL. DESIGN PRINCIPLES THAT YIELD MODULARITY. GENERAL COMMENT ON MODULARITY AND SOCIAL LEARNING. ACCELERATING EVOLUTION THROUGH SOFTWARE REUSE. CHAPTER 5: Extending the Software Capital Structure: The Promise of Component Markets. THE ECONOMIC PARADOX OF SOFTWARE CAPITAL. NEEDED: MARKETS FOR INSTANCES RATHER THAN FOR CODE. ASPECTS OF COMPONENT MARKET EVOLUTION. CHAPTER 6: Summary: Foundations and Implications for the Software Development Industry. A HISTORY OF COPING WITH INCREASING COMPLEXITY. IMPLICATIONS FOR THE DESIGN PROCESS. IMPLICATIONS FOR THE FUTURE OF THE INDUSTRY. APPENDIX A: Irrelevance of the Mainstream Theory of Economic Growth. PROBLEMATIC ASPECTS OF TRADITIONAL GROWTH THEORY. MISSING STRUCTURAL ELEMENTS: COMPLEMENTARITY AND INDIVISIBILITY. SHORTFALLS IN THE "NEW GROWTH THEORY" OF PAUL M. ROMER. APPENDIX B: Applicability to Hard Tools.